Other: Bonus for people that got Madokano. Universe: Post-TV anime timeline where they all survived. Universe: Inside Homuraâ€™s Rebellion dream. Universe: Inside look at the Law of Cycles. Universe: All over the place. Homura & Sayaka chilling. The call of MadoHomu once again binds me to this earthly realm, sublimating my ego into Translation NEO ZEED "MADOHOMU type" ã€œnew ver.ã€œ. I'm a big fan of a few Madoka doujin circles, and saw some of their works forgotten untranslated. 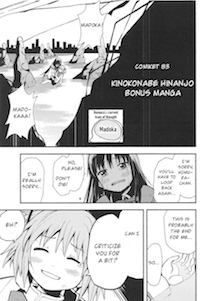 So now I'm trying to translate the Kinokonabe Hinanjo (Maitake) Madoka books that are out. Comments? Email me at franz at this website dot net.